It’s everybody’s favorite time of year! The Army’s FY19 DAWDF program of record was approved at $73 million. Commands received feedback on approved initiatives to begin planning for the upcoming fiscal year, and official notifications were completed on Sept. 21. The Army DACM office intends to fund respective commands through at least the first quarter, and commands are encouraged to execute all approved initiatives and funding during FY19. Registering for classes? DAU launched its new virtual campus using Cornerstone on Demand. Their webpage answers frequently asked questions and provides links to their student guide and task aids. For questions or problems with online training, please contact the DAU Help Desk at dauhelp@dau.mil or 866-568-6924. 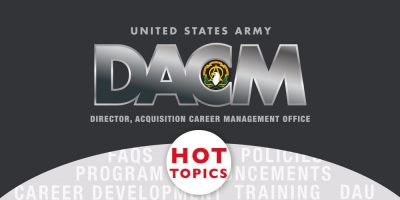 Coming soon: The quarterly Army DACM Newsletter will be out this month, answering those burning questions, giving career advice, and showcasing the accomplishments of some very talented program graduates. Stay in the know! Check out the October-December edition of Army AL&T magazine! Quick turn but a worthy program: The 2019 DOD Industry Exchange Program Pilot, a DOD and private sector exchange, will serve as a platform for civilian acquisition participants at GS-13 through GS-15 or broadband equivalent to better understand each other’s business operations and challenges and share innovative and cost-saving practices. 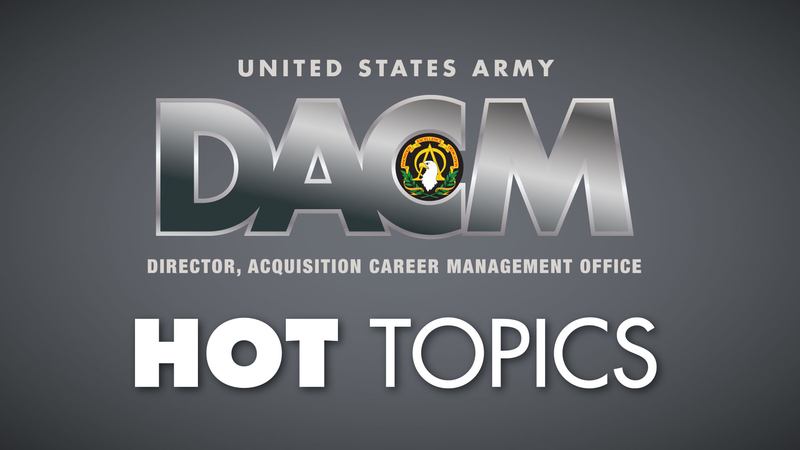 This exciting professional development opportunity will be considered a detail for participants from DOD. Applications must be submitted by Thursday, Oct. 4. For more information, contact Maj. Hassan Kamara at m.kamara.mil@mail.mil or 703 664-5702. Are you a future acquisition leader? IDEAL—Inspiring and Developing Excellence in Acquisition Leaders,—a leader development program for acquisition professionals at GS-12 and GS-13 (and broadband equivalents), is open for applications through Jan. 4.